Other designations: Church of the Holy Saviour (Surb Prkitch); Church of the Holy Saviour of All (Surb Amenaprkitch); Aziz Patrik Kilisesi; Halaskar Kilisesi; Keseli Kilise. "In the year 480 (A.D. 1035), I, Ablgharib marzpan (general) took an edict on behalf of Smbat shahanshah (king of kings) to Michael, Emperor of the Greeks, at Constantinople, and with great effort and great expense I bought a fragment of the Holy Cross, and when I returned, completed this temple..."
This large church was completed around the year 1035, and the walls are covered with long and elegantly carved inscriptions that reveal much of its history. 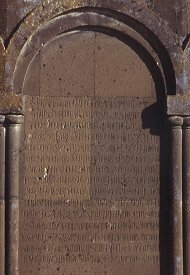 The inscription partially reproduced above records that the church was commissioned by prince Ablgharib Pahlavid to house a fragment of the True Cross. He had obtained this relic after a visit to Constantinople, and in the inscription he commanded that nightly services should be held within this church until the second coming of Christ. 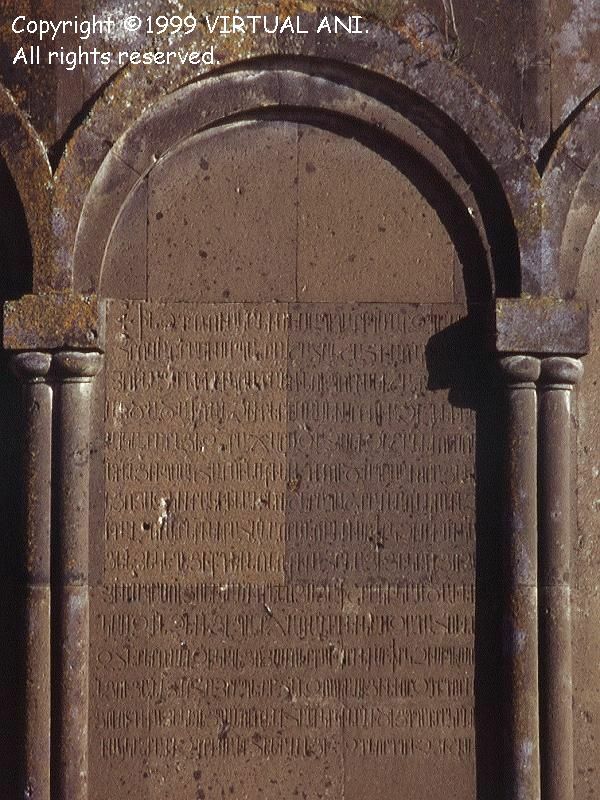 Other inscriptions record a restoration of 1193, by a priest named Trdat, in which twin zhamatuns (outer halls) were added to house pilgrims; and another from 1291, recording that a man named Mkhitar had built a bell tower in front of the entrance. These structures have entirely vanished except for the concrete staining on parts of the facade. 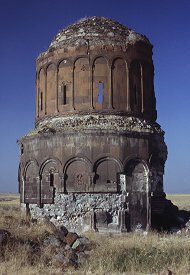 Another inscription tells that in 1342, prince Vahram Zakarid ordered a restoration of the cupola that was undertaken by the architect Vasil. There is also an inscription on the upper part of the south facade bearing the name "Trdat". 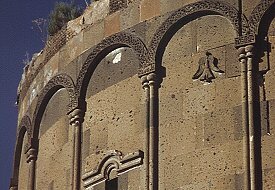 Some have identified this Trdat as the famous architect Trdat, designer of the Ani cathedral and King Gagik's circular church. This is unlikely: the earliest known works by Trdat are from the 970s, so he was probably dead by the time this church was being constructed. The name may actually refer to the same Trdat who is mentioned in the 1193 restoration inscription. 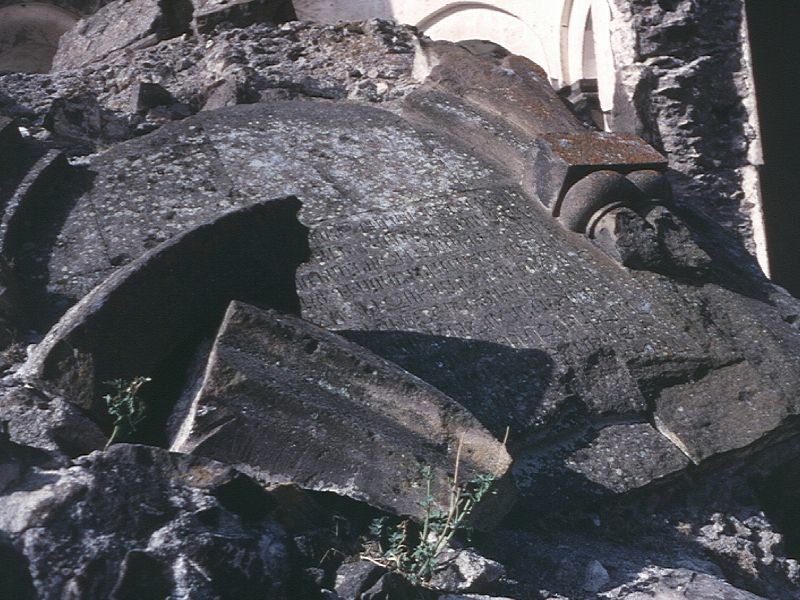 By the end of the 19th century the church was still intact, but in an advanced state of decay. "This building will not endure for many years longer, unless steps be taken to save it from falling in", wrote H.F.B. Lynch after visiting Ani in 1894. In 1912 the Russian excavators restored a large section of masonry on the eastern facade. After the restoration, a door with a lock was added and a small museum containing stone objects was created within the church. 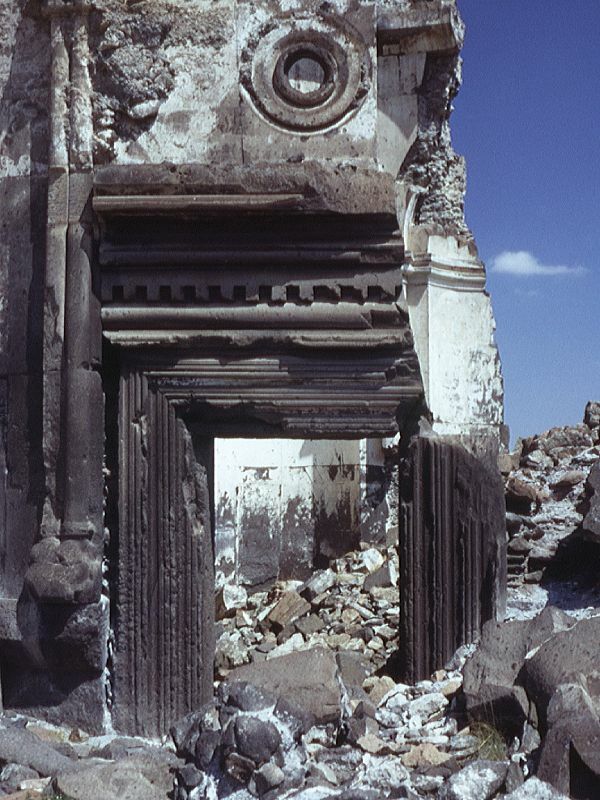 The eastern half of the church collapsed during a storm in 1957. Some books date this collapse to the 1930s - but the 1950s date is confirmed by local villagers, and apparently the sound of the falling masonry was heard in the village just outside the walls. 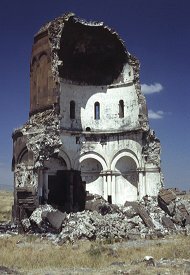 The remainder of the church was badly shaken during the December 1988 earthquake and now is in danger of total collapse. 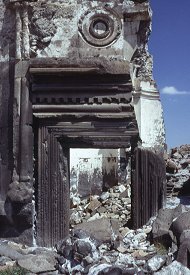 In 1999 the doorway was blocked with a roughly constructed rubble wall in a belated attempt to prevent further collapse. In reality it will have no effect, but when the final destruction comes it will give those responsible the excuse that they did something to try to prevent it. This work was organised by a foreign architect, I am told. The church is approximately circular, with the lower half of the exterior divided into a 19-faced polygon. The very tall (and very wide) drum is, unusually, not divided into a polygon but is a perfect circle. 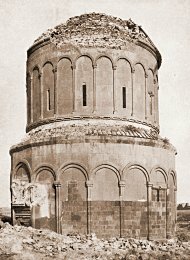 It is pierced by 12 narrow windows, and is capped internally with a semicircular dome. The church has only a single entrance, in the south facade, through a monumental rectangular doorway that is topped with an architrave of pseudo-Antique carving. The interior had eight apses, with the altar apse much larger than the rest. On either side of the altar apse were tiny chapels, squeezed into the wall thickness. 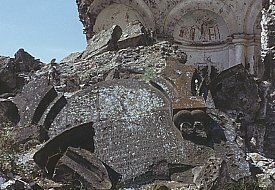 These chapels, and the enlarged apse, probably weakened the structure to the extent that it was damage here that led to the church's eventual collapse. 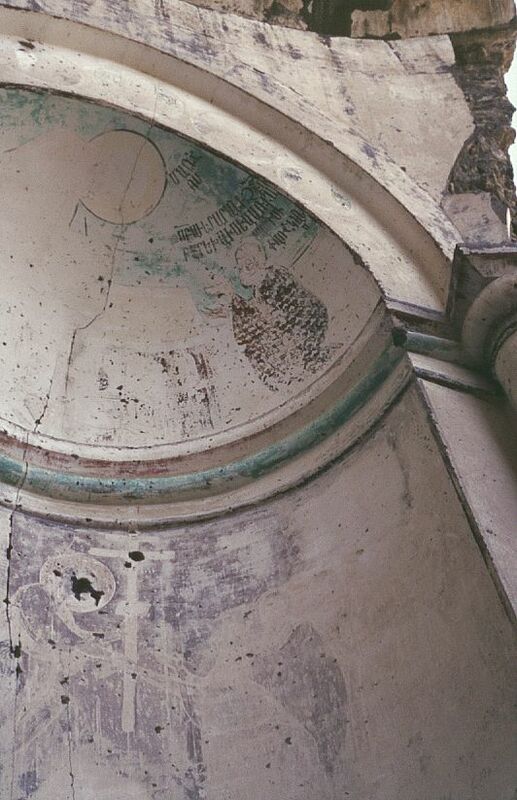 There are faint frescoes in the walls and semi-domes of each surviving apse, and on the pendentives. They are of high quality and are rather Byzantine in style, but the painter was an Armenian - Sargis P'artchkans. They probably date from the end of the 13th century (perhaps from the 1291 restoration). At a later date they seem to have been covered in whitewash (was the church once used a mosque?) and are now in a very damaged condition. 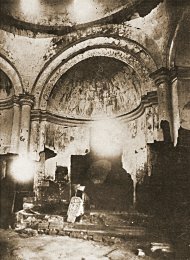 The destroyed altar apse had a painting of Christ enthroned, the other apses contained scenes related to the life of Christ and the four Evangelists. The enormous diameter of the drum (which is not much less than that of the base of the church) is the most startling aspect of the design. 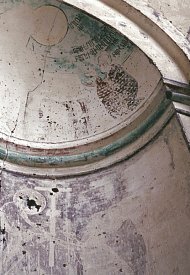 The present appearance of the drum is considered by some to date entirely from an enlargement during the 1342 restoration. I doubt this. 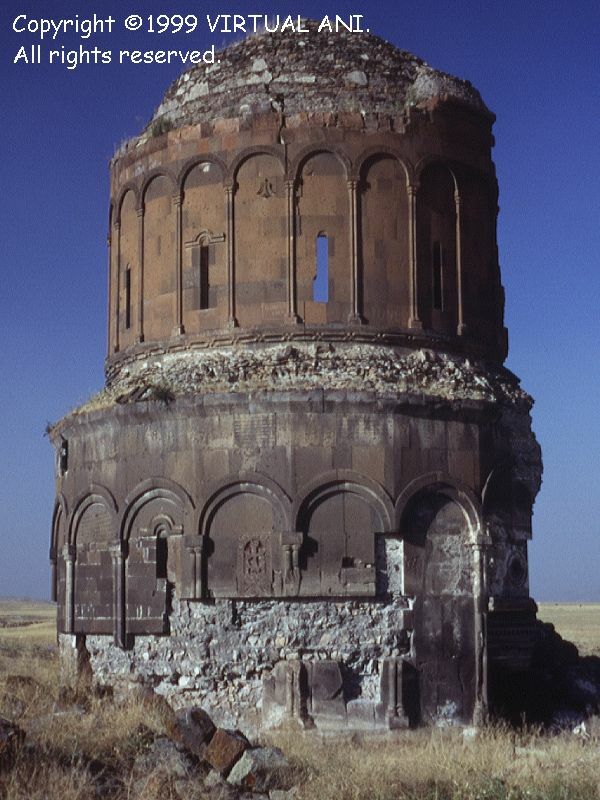 I do not think Ani by the mid-14th century had the technical prowess or cultural confidence to create such a dome; and if the pre-1342 drum was much smaller, then how was it supported over the church? Also, the lower parts of the church seem to have been designed with a large dome in mind. 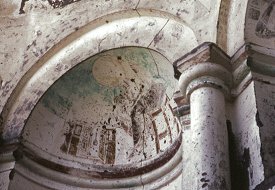 A huge drum and dome puts considerable strain on the supporting walls - to minimise weakening there were no windows in the lower body of the church, except a porthole above the doorway and a tiny window in the apse. The Church of the Redeemer is one of the most geometrically pure Armenian churches, it is made up solely from elemental geometrical volumes - cylinders and spheres. It is also the most technically adventurous building in Ani. 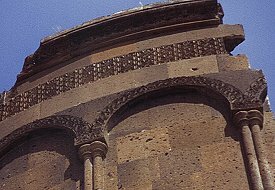 The construction method used in medieval Armenian architecture - a core of crushed stone and concrete conglomerate with surface layers of cut stone - results in a monolithic structure. This church takes the qualities inherent in such monolithic structures to new heights. Walls, roofs, drum, dome, columns, apses, have become merged into a single, unified, physical entity. 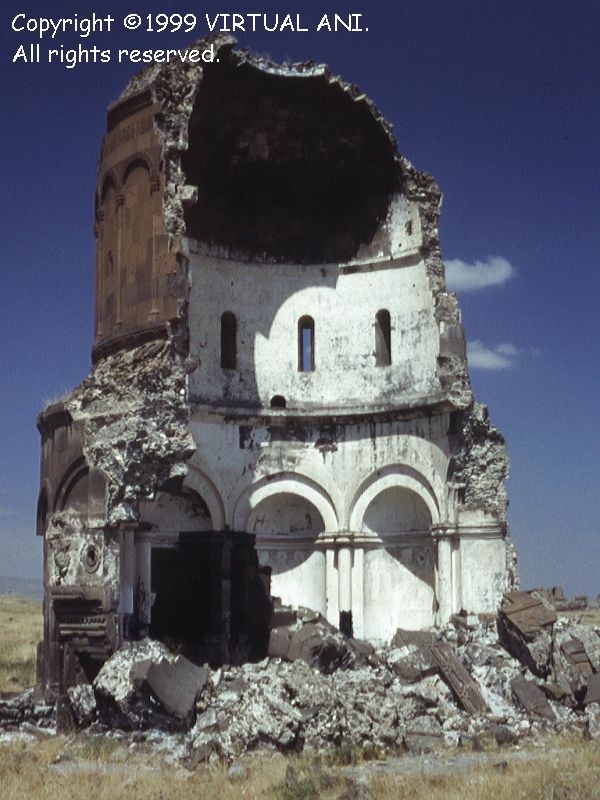 That is why when the collapse came half the church was totally destroyed - structurally it was all or nothing. of the interior of this church. This page [church of the Redeemer] was first published in 1999. It was last modified on the 24th May 2005.